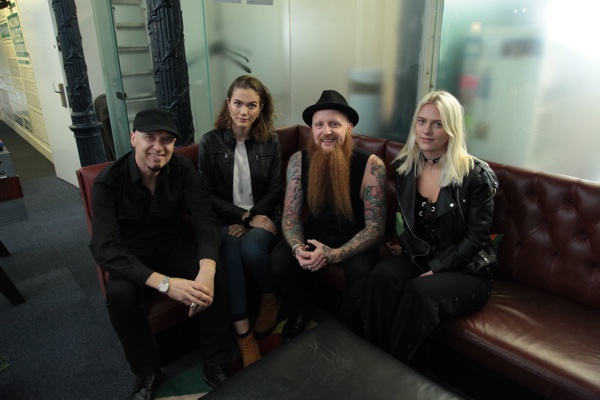 The Academy of Contemporary Music (ACM) were thrilled to welcome legendary guitarist Mikey Demus to Metropolis Studios for an exclusive masterclass in September. Hosted by Ace, the Academy's Head of Creative Industry Development (also known as the guitarist in Skunk Anansie), Mikey spoke to the students about his career, with plenty of advice and, of course, found time for some amazing solo performances. Before joining alternative/nu-metal/reggae outfit Skindred, Mikey was first inspired to pursue music when he saw Woodstock on the TV aged just 12. After inspiration had struck, Mikey began to really practise the guitar - playing along to the likes of Nirvana, Skunk Anansie and Reef to name just a few. Revealing that his Dad had been a guitarist since before he could remember, Mikey shared with the students how even though he's right-handed, he plays a left-handed guitar because that's what his Dad had. At 18, Mikey was playing in a band with his sister. A girl in a band they often gigged with was dating Skindred's bassist and, through that connection, Mikey successfully auditioned to join the band. When discussing the inner-workings of the award-winning group, Mikey explained how Skindred love performing at festivals and that they select the ones they would like to do before working out their tour schedule around those dates. Sharing that they like to give fans of all ages the opportunity to see a show, Mikey explained that they play a lot of gigs outside of the big cities. Questions were welcomed throughout the class and the students asked Mikey about his writing process. Saying that ideas often come to him when he's not with his guitar, Mikey told the class that he hums them into an app on his phone, jokingly adding "so many of my ideas have a drone of a tour bus in the background!" When discussing gear, Mikey said that he was trying to scale down his live rig as it actually costs a lot to transport all the gear. After chatting to fellow guitarist Ace about the "romanticism for having loads of pedals", Mikey spoke about how he uses Ableton Live when performing on stage - sending MIDI to the gear so he doesn't have to worry about 'tap dancing' whilst playing. The class then moved on to a discussion about gear and recording sessions. Bringing five or six guitars to a studio session, Mikey said when they find something that works they stick with it and often only use two guitars on an entire record to keep the sound consistent. Sharing that they have used the same producer for the past three albums, he told the students that the band spend one or two weeks in pre-production so that they know exactly what to do when it comes to laying down the tracks in the studio. Wrapping up with a final performance of Warningfrom the Union Black album, the students left feeling very inspired to advance their own music careers. Mikey clearly enjoyed the class too, saying "I think what's great about ACM is that the staff are part of the industry themselves they're doing it, they're out there, playing, touring, recording - you're tapping into first hand experience from people who are involved and I think that's such a massive asset for anyone coming along to ACM."